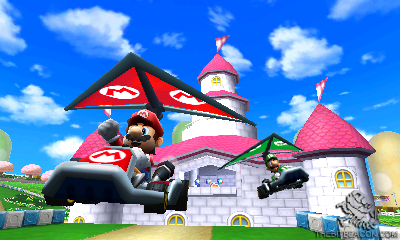 Mario Kart is a franchise that needs no introduction. It is quite possibly some of the most fun you can have with a group of friends. 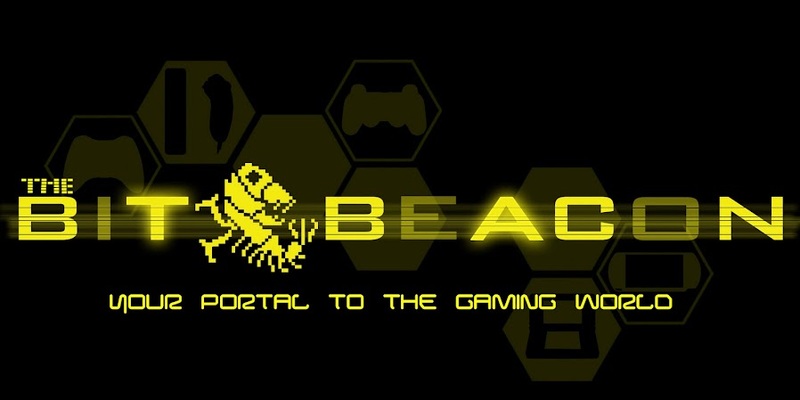 The series has always been easily accessible by newcomers but it also offers a level of depth for those willing to spend the time to master the game and its controls. Mario Kart 3DS is no different. 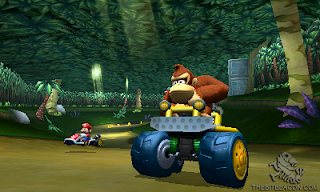 The E3 demo consisted of three races on three brand new tracks with one of them being themed around Donkey Kong Country Returns. Which makes sense since Retro Studios is contributing to the game. The new tracks fit right in with the series, they feature all sorts of turns, traps, and power ups. However tracks now feature gliding and underwater sections. The gliding mechanic is intuitive; it works just like you think it would. Whenever you jump off specific ramps and ledges a hang glider like attachment pops out of your kart and you begin gliding. You can tip the nose of your kart up or down to speed or extend your decent. This can be used in a variety of ways to avoid certain obstacles or collect extra coins in the sky. 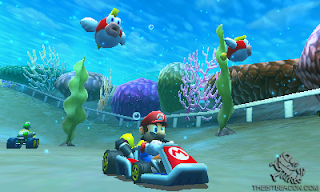 With the underwater segments the way driving works doesn’t change. A propeller attachment will come out of the backside of your car as soon as you take a dip. No longer does falling into water necessarily mean a visit from Lakitu who would drag the player out of the water while taking up precious seconds. Now falling in the water could net you a shortcut or some extra item containers not on the main course. It adds an interesting element and encourages some exploration of the tracks. All three of the races were pretty easy to win; I imagine the AI was set to easy so attendees could feel like champs when they won. ‘Snaking’ is in the game and was very easy to pull off and it no longer kills your thumb like it did on the DS thanks to the circle pad. You can also now mix and match different pieces of the karts to create your own unique ride. The game also runs at a very smooth 60 frames per second with the 3D on full blast, it looked incredibly gorgeous. Nintendo is aiming to have up to eight person multiplayer in the retail build of the game which is the norm for the series. These new additions do a good job of spicing up the traditional gameplay of the series without making it awkward like Double Dash did. The game is now at the top of my must have list. I can’t wait to get down with some crazy multiplayer sometime this holiday season. Double Dash was the best of the series, imo. The mini games were a blast anyway. I honestly don't see how this one will be any better than DiddyKongRacing* It had so much potential. The best part? getting to fly an airplane! ....what about that canceled DK racing game for the gcn?